But we know that’s not going to happen, so I have a time goal as well. Several, in fact. I haven’t shared them with anyone, for fear of jinxing my race. But, what the heck. I tell you everything, anyway. My previous marathon finish time – back in ye ol’ days of 2006 – was 4:22:43. At the very least, I can do that now? 4:22:42, even? Take a look at this pace predictor: you enter your times for a recent race, whether a 5K, 10K or half marathon — all distances are available — and it gives you an approximation of your finishing times for all other distances. Based on my half marathon PR, I should be able to run a 4:09:09 marathon. 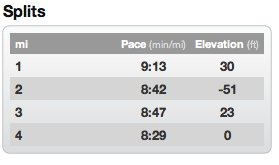 Based on my latest 10K time (a PR), I should be able to run a 4:04:31 marathon. Either of those would be quite awesome. Tell me you’ve heard about the Yasso 800s? I did a modified version of those as part of my training plan: instead of building up to 10x 800 on a track, I did 10x 4 minutes, which in my case is 800+ maybe another quarter of the track (or could be less, I never measured it precisely). BUT. According to Bart Yasso, I could run a 3:50-3:55 marathon. What? That sounds crazy to me, but there you have it: a sub-4 marathon would be my ultimate dream goal. If I pulled that off, I swear Santa Monicans will be watching me take a (fully clothed!) dip in the Pacific post race, for real. And there you have them, my marathon goals. I wish I could say my goal is to qualify for Boston, but in case you missed it, I have a completely different strategy for that one. Working against me is the fact that I’m starting with the “general” wave of runners/ walkers. The LA Marathon has unusually stringent requirements for placing you in a seeded corral: you must have completed a marathon no earlier than in 2011. 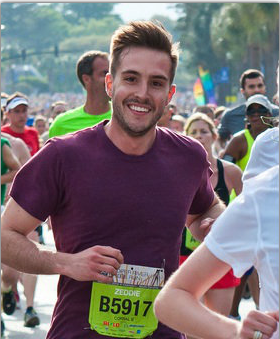 FYI, LA Marathon, that’s unfair to runners (not walkers) who are trying the distance for the first time. 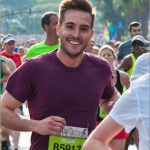 What if I’m running 1:30 half marathons, but I’ve never done the full distance? It would be a huge disadvantage to have to line up in the back, and possibly zig-zag around slower runners for miles on end. I guess I’ll have to hope there are a lot of fairly fast first-time marathoners–or those like me, who’ve been on a marathon hiatus for a while–so I can start out at a normal pace from the get-go. Hmmm. Looks to me like running by parking lot after parking lot? If you live in the area and are looking for a 5K benefitting a great cause: there you have it. Today’s run: The last run before the marathon, an easy three-miler. Today is Pi day, though, and that had to be observed, right? I know we’re supposed to celebrate Pi day by eating pie, but we don’t have any at the house right now — and we leave for LA tomorrow. Meaning, I wouldn’t want to have to eat the whole thing tonight so it doesn’t go to waste. Much easier to tack on .14 miles to the three and there you have it: 3.14 for 3/14. Aleks, I’m *so* excited for you, and wish I could head down to L.A. to cheer you on! Good luck! I think you’re going to kill it! Have fun taking a dip in the ocean!